The nature of dark matter is one of the greatest mysteries in modern astrophysics. Based upon observations of stellar motions within a galaxy, we know that regular matter makes up only a fraction of a galaxy’s mass. 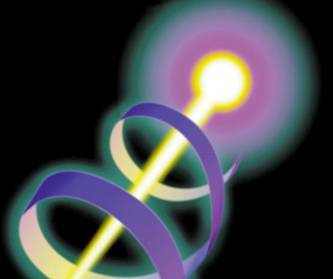 The rest consists of a “dark” matter that doesn’t interact strongly with light. We can see that dark matter exists through galactic collisions like the Bullet cluster. Through its gravitational effect we can map the distribution of dark matter in the universe. So we know quite a bit about dark matter, but we don’t know what dark matter actually is. Actually that isn’t quite true. We do know of one type of dark matter, and we’ve even detected this dark matter in experiments on Earth. This particular type of dark matter is more commonly known as neutrinos. We normally don’t think of neutrinos as dark matter, but neutrinos have mass and they don’t interact strongly with light. Because their mass is very small, they move at speeds close to the speed of light, so they are a type of dark matter known as hot dark matter. So why is dark matter still a great mystery? Because neutrinos cannot be the only type of dark matter there is. To begin with, they have such a low mass that it isn’t enough to account for all the dark matter effects we observe. Also, the distribution of galaxies in the universe doesn’t match the effects of hot dark matter. Instead, dark matter must mostly consist of slow moving “cold” dark matter. That’s where the mystery lies, because we don’t know what this cold dark matter is. But the solution still might be neutrinos. Not the type of neutrinos we’ve already discovered, but another type known as sterile neutrinos. It turns out that neutrinos have an interesting property. When they are produced in particle interactions or nuclear decay they always spin in the same direction relative to their motion. This spin-motion connection is known as helicity, and in general can be right handed or left handed. If you imagine your thumb pointing in the direction of a particle’s motion, with your curled fingers representing the direction of the spin, then you can see which is which. Neutrinos are always formed with a left handed helicity. Back when we thought neutrinos didn’t have any mass, it was thought that all neutrinos must be left handed. This is because massless particles move at the speed of light, so they couldn’t change helicity. But since we now know that neutrinos do have mass, it is possible for certain interactions to change the helicity of a neutrino. So there are likely right handed neutrinos. Regular neutrinos interact with particles through the electroweak force. Since the electroweak interaction always produces left handed neutrinos, it must be the case that right handed neutrinos don’t have an electroweak interaction. Thus, right handed neutrinos can only interact via gravity. For this reason, right handed neutrinos are known as sterile neutrinos. We don’t know why the electroweak force only interacts with left handed neutrinos, but one possibility is that right handed neutrinos are somehow much more massive. If that is the case, then they could be heavy enough to be cold dark matter. There are some hints that dark matter consists of sterile neutrinos, but they are just hints and there are other hints that other types of particles are dark matter. Right now we just aren’t sure. But it might just be that the dark matter particles we’ve known all along might be the solution we’ve been searching for all these years.